DOCTOR STRANGE, OR HOW I DIDN'T LEARN TO STOP WORRYING AND LOVE MARVEL FILMS. Many critics will tell you that there are too many damn superhero films. I don’t agree with this statement particularly; the problem is not the number of them, but the fact that too many of them are just not very special. Because they’re saving the best villains for crossover epics, watered down lesser villains are utilised, there is always a McGuffin, and the tone is either darker than a nihilist’s fever dream or so archly knowing the audience is left paralysed and nihilistic. Doctor Strange is both a success and a failure in terms of meeting the high standards by which I judge my silver screen spandex. Benedict Cumberbatch, an actor I personally dislike but can always respect for being exceptional in his field, is the weakest link here oddly. His accent is jarring, his manic arrogant genius falls far short of other similar roles he has previously played. Before he was cast, Matthew Modine was lobbying for himself to play the role which would have been far more interesting, but Marvel in their infinite desire to appeal to the masses (and Cumberbitches, or whatever they’re now calling themselves) cast an actor who is much too young. The origin story is quite basic: Stephen Strange is a pompous surgeon who, due to a very satisfying car accident, is left unable to use his hands. Lost, distressed and barely capable of spitting poisonous barbs at Rachel McAdams' cardboard cutout and a sadly underused Michael Stuhlbarg, he journeys to an ancient mystical temple that previously saved a quadriplegic. If it sounds like I didn’t enjoy the film, that’s probably because I didn’t. However it is the most visually stunning Marvel film to date, and well worth the 3D ticket price. Its action sequences are original, engaging and mind blowing. It’s just a huge pity the characterisation is so bare because it could truly have been Marvel’s best film in years. As a massive superhero fan, I haven’t been blown away by a Marvel Studios film since Iron Man 3, so perhaps I am not their target audience having thought Captain America: Civil War, Guardians of the Galaxy and Captain America: Winter Soldier only mediocre. 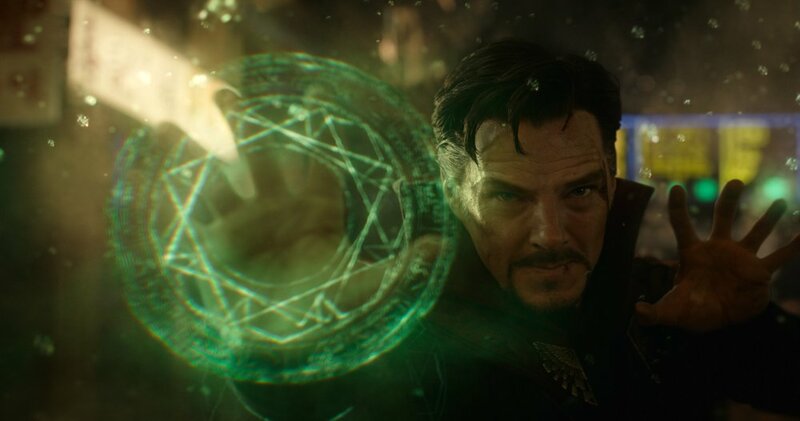 Scott Derrickson, director of the excellent Sinister and writer of the very underrated Sinister 2, has clearly nailed the visuals of Doctor Strange, and the trippy Ditko influenced set piece for the climax is absolutely ravishing. Sadly, though Strange does have redeem himself over the course of the film, he is no more likeable, and his supporting characters are never particularly interesting. Chiwetel Ejiofor scrounges for memorable moments as Baron Mordo, and while I could watch Mads Mikkelsen watch paint dry and still count it as time well spent, his character Kaecilius is too underused to have any lasting effect. Only Benedict Wong, as a Master of the Mystic arts, has any fun in the role. Perhaps I am being curmudgeonly, and most of the other reviews I have read of Doctor Strange indicate I am, but I am more disappointed by Doctor Strange than I have been by a Marvel film in a while. It has such incredible potential and grasps at greatness at various points, but it falls short ultimately. It’s not enough to create an incredibly interesting and dazzling new world, if you don’t fill that world with anyone who is any way interesting.